In this paper we show that the logical framework proposed by Becker et al. to reason about security policy behavior in a trust management context can be captured by an operational framework that is based on the language proposed by Miller to deal with scoping and/or modules in logic programming in 1989. The framework of Becker et al. uses propositional Horn clauses to represent both policies and credentials, implications in clauses are interpreted in counterfactual logic, a Hilbert-style proof is defined and a system based on SAT is used to proof whether properties about credentials, permissions and policies are valid in trust management systems, i.e. formulas that are true for all possible policies. Our contribution is to show that instead of using a SAT system, this kind of validation can rely on the operational semantics (derivability relation) of Miller’s language, which is very close to derivability in logic programs, opening up the possibility to extend Becker et al.’s framework to the more practical first order case since Miller’s language is first order. In this paper we show that the logical framework proposed by Becker et al. to reason about security policy behavior in a trust management context can be captured by an operational framework that is based on the language proposed by Miller to deal with scoping and/or modules in logic programming in 1989. The framework of Becker et al. uses propositional Horn clauses to represent both policies and credentials, implications in clauses are interpreted in counterfactual logic, a Hilbert-style proof is defined and a system based on SAT is used to proof whether properties about credentials, permissions and policies are valid in trust management systems, i.e. formulas that are true for all possible policies. Our contribution is to show that instead of using a SAT system, this kind of validation can rely on the operational semantics (derivability relation) of Miller’s language, which is very close to derivability in logic programs, opening up the possibility to extend Becker et al.’s framework to the more practical first order case since Miller’s language is first order. Edelmira Pasarella; Lobo, J. 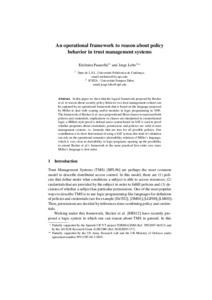 An operational framework to reason about policy behavior in trust management systems. A: Alberto Mendelzon Workshop on Foundations of Data Management. "AMW 2014: Alberto Mendelzon Workshop on Foundations of Data Management: Proceedings of the 8th Alberto Mendelzon Workshop on Foundations of Data Management: Cartagena de Indias, Colombia, June 4-6, 2014. (CEUR Workshop Proceedings; 1189)". Cartagena de Indias: 2014.